From the opening line of this novel, the scene is set. The importance of the river, the importance of the characters, and the importance of relationships. It also lays the first hint that not all may be as it seems within this family story. Spilt Milk is the story of sisterhood and motherhood through the generations of a single family. Starting in 1913 with three sisters living an idyllic life in a cottage near a river in rural Suffolk. As the two youngest, Nellie and Vivian, blossom, their innocent existence is blown apart when a stranger, Joe Feriers, arrives in town. Both Nellie and Vivian fall for Joe and the consequences are devastating, creating a secret the sisters will be forced to carry to their graves, overshadowing everything else life presents them. We follow Vivian and Nellie’s life stories right through into the 1960s. From their unusual start in life, they do go on to marry and create lives of their own, apart from one another – a fact that would have shocked the women at the outset. The author manages to convey wonderfully that not only do the sins of the father (or mother) echo on through time, but that generations of the same family can often inexplicably face similar life events, and it is interesting to see how each generation deals differently with them as time rolls on. Nellie and Vivian are interesting characters, strong in their own ways, yet equally vulnerable. At some points Nellie takes the lead, finding strength from her passion for the river, always recalling the sense of power it gave her. At others, Vivian is the rock Nellie relies on to keep her sane, more of a mother to her than her birth mother. The birth of Nellie’s daughter, Bertha (known as Birdie) and her life path, adds yet another layer of secrecy to the sister’s relationship. Birdie blossoms into a superb character in her own right, and her story is equally as captivating, and at times heart breaking, as that of her mother and aunt. The final piece in the family jigsaw here is Framsden, Birdie’s son. I thought Amanda’s first novel, 22 Britannia Road, was beautifully written and have eagerly awaited her second. And it doesn’t disappoint. There’s even more of a lyrical quality to Amanda’s writing here, which works perfectly, some scenes are so intense they are almost cinematic. The setting is perfectly described and the sense of time, as we move through the war years and onwards, is breathtakingly detailed and accurate. You feel as if you have stepped right into the character’s shoes and are seeing the world just as they knew it – whether it be the grime and danger of war-ravaged London or the open spaces and simple beauty of rural Suffolk. At the same time, while time moves on, you have a sense the author really wants to bring home the message that age is just a number, a date is just a reference, and that nothing really changes. Not really. Nothing of importance, such as love and loss, grief and happiness. 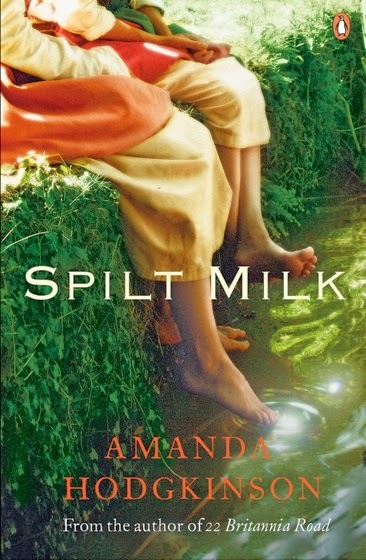 Spilt Milk is a beautiful novel. I was captivated by the story, the characters and the shadows they carried – and I’m sure you will be too. Thank you for this review. I hadn't realised Amanda Hodgkinson had published a second novel. I loved 22 Britannia Road and so I've already pre-ordered a copy of this one for my Kindle. I can't wait to read it. In addition to loving her writing, I also have a special affection for Amanda as she was a judge for a flash fiction competition in which she awarded me 3rd place. It was my first success so she instantly became my favourite author ever!